This bass solo from act II, scene 2 of Verdi's Rigoletto has been edited by Lawrence Hurst, former principal bassist with the Dallas Symphony Orchestra and Professor and chair of the String Department at Indiana University School of Music since 1986. Hurst's bowings, fingerings and other editorial markings have been added throughout the score. Rigoletto by Giuseppe Verdi is regarded as one of greatest of operas in the standard repertory today. Written in 1851, Verdi completed the opera in about six weeks, and it premiered to tremendous success, despite issues of censorship and political unrest at the time. The tragic story revolves around the licentious Duke of Mantua, his hunch-backed court jester Rigoletto, and Rigoletto's beautiful daughter Gilda. Originally written as a three act opera, today it is generally presented in four acts. This solo is from the second scene in the beginning of Act II. 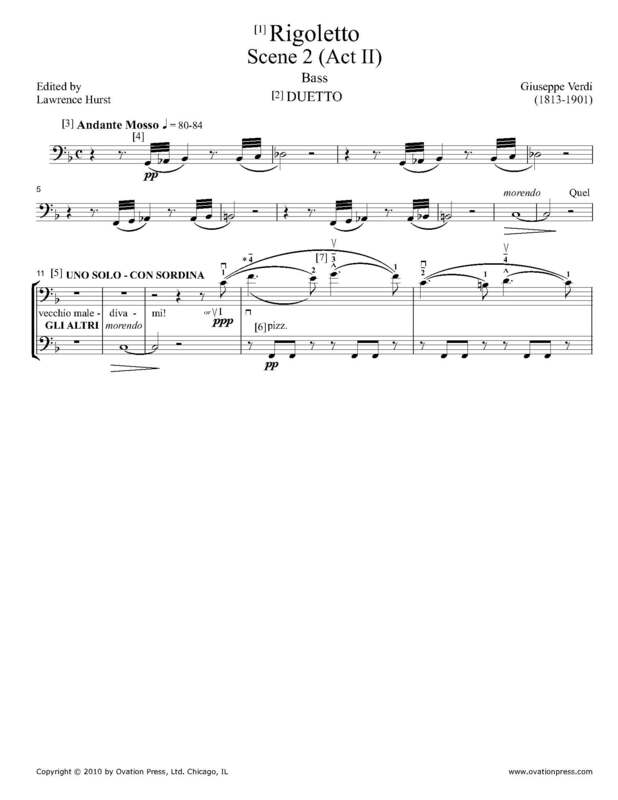 Download and print the score today to gain access to expertly edited Verdi Rigoletto bass fingerings and bowings from Lawrence Hurst! Please note: This solo is edited in a comprehensive and detailed manner. Lawrence Hurst’s insightful performance suggestions are enclosed with this music. There are three pages of music encompassing the bass solo from Act II, Scene 2 and one page of commentary and instruction.